The militant Islamist group Boko Haram's increasingly bold attacks in Nigeria—most notably its April kidnapping of nearly three hundred female students—threaten to fuel further Muslim-Christian violence and destabilize West Africa, making the group a leading concern for U.S. policymakers, writes former U.S. 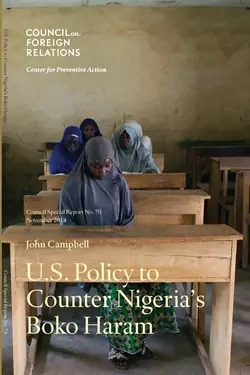 Ambassador to Nigeria John Campbell, CFR senior fellow for Africa policy studies, in a new Council Special Report from the Center for Preventive Action (CPA). Boko Haram's proclamation that it has established an Islamic caliphate has stoked global fears over the insurgents' rapid ascent in Africa's most populous country ahead of the February 2015 national elections. Campbell, however, warns U.S. policymakers to resist characterizing Boko Haram as simply another foe in the global war on terrorism, since the group's grievances are primarily local. "The Boko Haram insurgency," Campbell explains, "is a direct result of chronic poor governance by Nigeria's federal and state governments, the political marginalization of northeastern Nigeria, and the region's accelerating impoverishment." Rather than fighting the militant group solely through military force, he argues, the U.S. and Nigerian governments must work together to redress the alienation of Nigeria's Muslims. "Washington should follow a short-term strategy that presses Abuja to end its gross human rights abuses, conduct credible national elections in 2015, and meet the immediate needs of refugees and persons internally displaced by fighting in the northeast," Campbell continues. He also recommends that the Obama administration revive plans to open a consulate in the northern city of Kano in order to improve U.S. outreach to that region's predominantly Muslim population. Though the United States has "little leverage" over President Goodluck Jonathan's government, Washington should "pursue a longer-term strategy to address the roots of northern disillusionment, preserve national unity, and restore Nigeria's trajectory toward democracy and the rule of law." encouraging Abuja to revamp the culture of its military and police. Read U.S. Policy to Counter Nigeria's Boko Haram, a report from CFR's Center for Preventive Action (CPA). CPA seeks to help prevent, defuse, or resolve deadly conflicts around the world. Council Special Reports are concise policy briefs that provide timely responses to developing crises or contribute to debates on current policy dilemmas. The reports are written by individual authors in consultation with an advisory committee. The content of the reports is the sole responsibility of the authors.